Swim and snorkel in clear water at Doctor's Cave and Fletcher Beach, dive in the ominously named Widowmaker's Cave, golf on courses such as Half Moon and Tryall. Off the beaten path, feed a hummingbird at the Rocklands Bird Sanctuary and tour Rose Hall Great House. In dark, feast on jerk chicken, dance to a reggae beat and gamble on The Hip Strip. Sangster International Airport (SIA) is regarded by many travellers as the gateway to Jamaica and the wider Caribbean. Located a few miles from Montego Bay, the airport lies in the centre of Jamaica's main tourism region and handled more than 1.8 million passengers in 2011. According to the hub, 72 per cent of people visiting the island each year use SIA as their primary airport. It is named after former Jamaican prime minister Sir Donald Sangster. With the resort itself situated close to the airport, many holidaymakers choose a rental car or taxi service to travel into Montego Bay once they leave the terminal building. Several car rental companies are based in the arrivals hall, while there are also two licensed taxi firms that operate from SIA. The taxi desk can be found just outside the customs exit. Montego Bay is Jamaica's second largest city by area and its population swells with a steady stream of visitors, due to its proximity to the airport and status as a popular cruise ship destination. The area was named 'the gulf of good weather' by Christopher Columbus, who dropped anchor there in 1494. It then became known as Manterias by Spanish settlers, although to many people Montego Bay is most famous for its historic ties with the slave trade. It became a key sugar port following the British takeover in 1655, with the surrounding parish of St James developing into the island's biggest sugar producer. Montego Bay witnessed the violent slave rebellion of Christmas 1831, when thousands of slaves led by Baptist preacher Samuel Sharpe staged an uprising against the British forces. People visiting the area today will find a bustling town and thriving port, although reminders of the resort's eventful past are still present. The Museum of St James, which is located in the Montego Bay Civic Centre, should be a captivating experience for people with an interest in the area's slave history. The building also contains a theatre and art gallery. For those who prefer to relax in the sun, Cornwall Beach offers two acres of white sand and plenty of amenities within the Montego Bay Marine Park. As with many beaches in Jamaica, visitors can rent umbrellas, sun lounges, snorkel equipment and more. Gloucester Avenue is Montego Bay's famous central thoroughfare, with a colourful assortment of bars, restaurants and souvenir shops running parallel to the beachfront. This is the place to go to experience the resort's bustling nightlife. Dunn's River Falls, although located more than an hour's drive out of Montego Bay near the town of Ocho Rios, is well worth the journey for many visitors. This spectacular waterfall is one of the most popular attractions in Jamaica and featured in the 1962 James Bond film Dr No. Rose Hall, a mansion in the Jamaican Georgian style on the outskirts of Montego Bay, is regarded by many people as Jamaica's most famous house. It is popular with fans of the occult as it was once the home of Annie Palmer, the White Witch. Areas such as Gloucester Avenue are best visited on foot, but holidaymakers are likely to require a car to make the most of Montego Bay and the surrounding area. It is also not safe for tourists to be out walking in some areas, particularly at night. 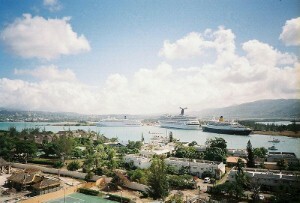 Jamaica has a tropical climate, with hot and balmy weather the norm. Those who dislike extremely high temperatures are advised to avoid the summer months, although this time is regarded as the off-season and is therefore when many resorts are less crowded.